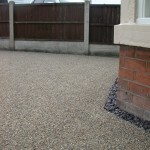 We have recently completed a resin resurfacing job in Mansfield for a client. The up and coming weather and threat of freezing temperatures spurred them on for their anti slip resin drive. We have over the past few years noticed an increase in the demand for resurfacing of imprinted concrete. Why? well we at Drive-Cote Ltd believe it is relative to the options available for sealing and protecting the imprinted concrete. Currently the seals and coatings currently available serve to protect the imprinted concrete, but at the same time do not offer adequate anti slip properties, and certainly not to the degree that an anti slip resin drive can. 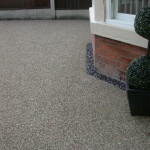 In fact the resin drive offers a degree of purchase and anti slip quality that most driveway surfaces cannot compete with. 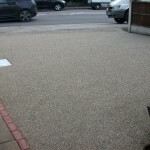 The resin bonded resurfacing allows the special granular aggregate to sit slightly proud of the resin offering the best anti slip qualities. Our resin bonded stone is a commercial product designed for thousands of cars breaking on it so it is well above driveway requirements. 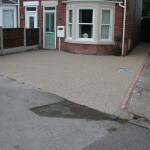 The Mansfield client is over the moon with the works completed and dont forget weed free as well. Quite a nice looking job to boot. In fact already we have had an anti slip resin drive referral from a local resident. But remember chose a local reputable installer like Drive-Cote Ltd. This time last year we were reporting on rogue traders so ask to see an example of works completed. 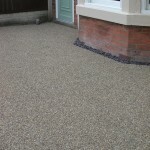 This entry was posted on Monday, November 30th, 2015 at 9:05 pm	and is filed under Block Paving, Chesterfield, Concrete, Diary of a Mansfield Resin Driveway Company, Driveways, Latest News, Mansfield, Nottingham, Paths, Resin Bonded Aggregate, Resin bonded path, resin drives. You can follow any responses to this entry through the RSS 2.0 feed. Both comments and pings are currently closed.